The Paper Mate Write Bros. Stick Pen is the high-quality, branded stick pen that everyone has trusted for years. With 34 different color combinations and a multi-color imprint, this everyday product is a colorful, traveling billboard. And it's competitively priced so you can get your message to the masses. Tungsten carbide ball means a smooth write every time. Backed by the Paper Mate unconditional guarantee, the Paper Mate Write Bros. Stick Pen is just the ticket for your everyday writing needs and budget. Nonrefillable, medium point, black Paper Mate ink in all colors. Blue ink available in select trim colors. Tungsten carbide ball. Write Bros can be customized with a multi-color imprint. Available Colors: Barrel Colors: White, Frosted, Silver. Black Barrel is only available with a Black Cap. Cap Colors: Teal, Forest, Green, Burgundy, Navy, Royal Blue, Red, Black, White, Purple, Orange. Ink Color: Medium Black Ink Only. Multi-Colored Imprint: Up to 4 Colors Max, Add $.08/each additional color. 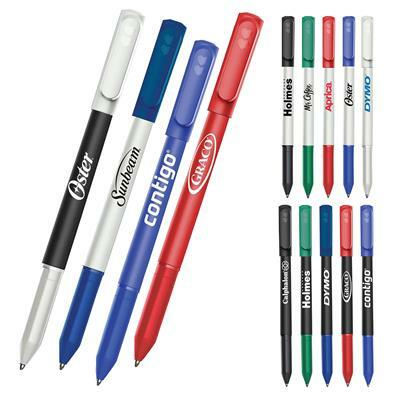 Promotional Paper Mate Write Bros Stick Pen, Item #WRITEBROS decorated with your company logo with no setup fees. The Promotional Paper Mate Write Bros Stick Pen is customized for your advertising needs. Promotional Paper Mate InkJoy Retractable Pen, Item #IJ300RT decorated with your company logo with no setup fees. 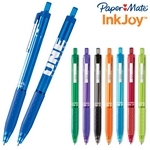 The Promotional Paper Mate InkJoy Retractable Pen is customized for your advertising needs. Promotional Paper Mate InkJoy Stick Pen, Item #IJ300ST decorated with your company logo with no setup fees. 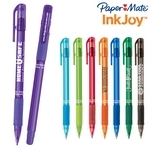 The Promotional Paper Mate InkJoy Stick Pen is customized for your advertising needs.